Ancestry: John Fisher Carleton; Hiram Carleton, Rev. ; Jeremiah Carleton; Jeremiah Carleton; Jeremiah Carleton; Joseph Carleton; John Carleton, Lt.; Edward Carleton, Esq. Born: 1889 in Sandwich Ma. Died: May 3, 1956 in Bourne Ma. at 66 yrs, 11 mos, 2 d.
Where Lived: 1315 County Rd. in Cataumet Ma. Married: September 22, 1917 in Bourne Ma. To: Robert Sylvan Handy; (1881 – 1972) (Henry Thomas Handy & Lilla Perkins (Ellis)); Robert married (2) Florence Moulton Lane Staebner (1887 – 1972) (Lemuel Hinman Lane & Ellen/Nellie E. Moulton) in Hancock N.H. on Abt.1957. 1. 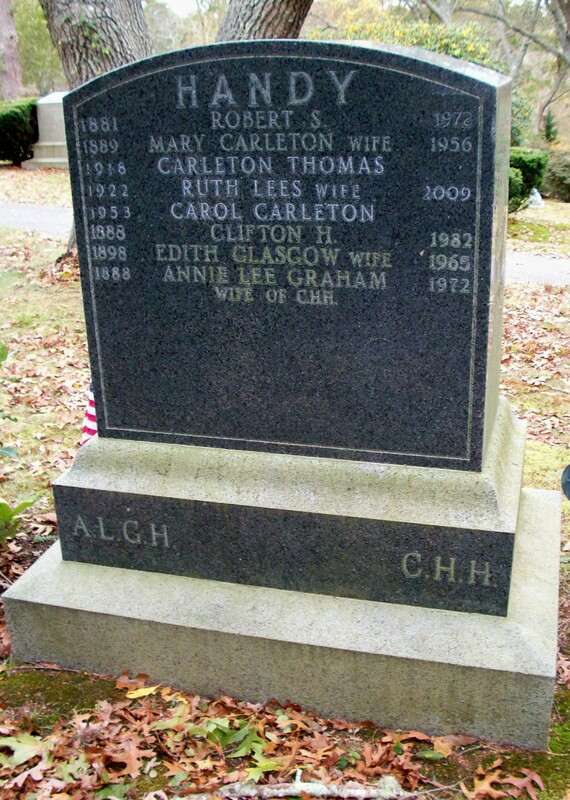 Carleton Thomas Handy; (July 16, 1918 – March 30, 2013); Married Ruth Lees (1922 – 2009) (George Lees & Martha Goebel) in New Haven Ct. on August 28, 1943; They had 3 daughters; Carleton was a member of Bourne High School Class of 1936; He & Ruth are buried in Cataumet Cemetery. 2. Ruth Ellis Handy Amend; (September 19, 1919 – December 25, 1987); Married Adolph Amend, Jr. (1912 – 1999) (Adolph Amend & Alice Howland) in Bourne Ma. 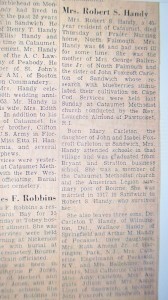 on February 21, 1942; Ruth & Adolph, Jr. are buried in Cataumet Cemetery. 3. Arthur Mitchell Handy; (April 3, 1921 – May 30, 1992); Married Margaret Keith Breneman (1917 – 2002) (Glenn Shaffer Breneman & Regna May Fulton); Arthur & Margaret are buried in Cataumet Cemetery. 4. 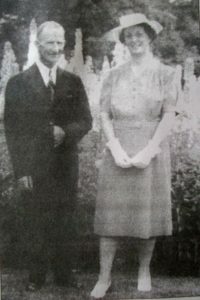 Isabel Foxcroft Handy Ballentine; (July 26, 1923 – January 15, 1984); Married George Francis Ballentine, Jr., WW ll (1917 – 1993) (George Francis Ballentine, Sr. & Elsie Avis Leonard) in Bourne Ma. 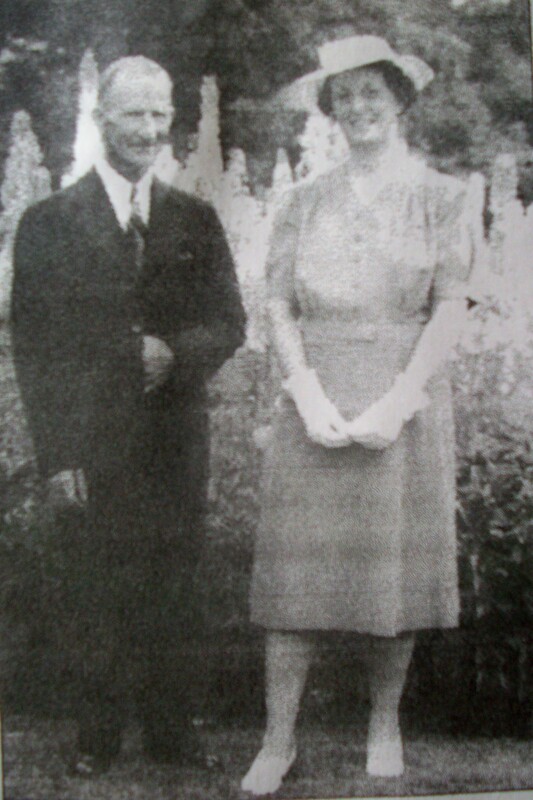 on February 28, 1942; Isabel & George, Jr. are buried in Cataumet Cemetery. 5. Catherine Handy Engelmann; (April 19, 1927 – July 2, 2003); Married Hans Bernhard Engelmann (1915 – 2008) in Bourne Ma. 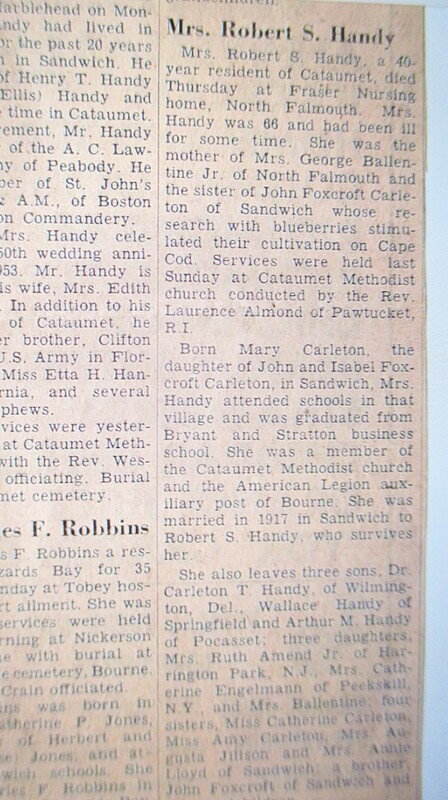 on December 20, 1952; Catherine & Hans are buried in Cataumet Cemetery. 6. Wallace Hathaway Handy; (August 2, 1930 – November 30, 1961); Married Catherine E. Hickey (1930 – 2009) in Hoyoke Ma. on November 12, 1955; Wallace, a high school teacher, died in Bristol Ct.; He & Catherine had 3 children.